Olivewood Cemetery Sign. Courtesy of the Descendants of Olivewood. Image available on the Internet and included in accordance with Title 17 U.S.C. Section 107. The Olivewood Cemetery Angel above the Baker headstone. Courtesy of the Descendants of Olivewood. Image available on the Internet and included in accordance with Title 17 U.S.C. Section 107. OLIVEWOOD CEMETERY. Olivewood Cemetery is located at the end of Court Street between Hicks and East Second Street in Houston. It lies in a bend of White Oak Bayou in the John Austin survey, in an area formerly known as Chaneyville. Founded in 1875, it is one of the oldest-known platted, African-American cemeteries within the Houston city limits. The Olivewood Cemetery Association, an incorporated African-American organization, was formed to maintain the cemetery. The incorporators were Ed. P. Turner, Edward Williams, David Osborne, and George Hooper. When the Map of Olivewood Cemetery, Houston, April 1877 was filed on May 4, 1881, seventeen stockholders held twenty-one of the twenty-two shares indicated. Stockholders of twenty-one shares were Frank Vance, Ed Williams, Jerry Smith, David Osborne, and Milton A. Baker, each with two shares; and Rev. David Elias Dibble, Matilda Dickerson, Abe Russell, Aaron Jefferson, James S. (Jim) Kyle, James Leroy James, Joe Sanders, Tom Freeman, Dave Righton, Henry Franklin, and Monroe Butler, each with one share. The map also indicates that the Rev. David Elias Dibble, the first ordained African-American minister of Trinity Methodist Episcopal Church, owned lot number 70 and lot number 8, perhaps originating the erroneous idea that Olivewood Cemetery was “owned” by the church. Headstone of Jane and Major Righton, the oldest recorded in the cemetery. Image available on the Internet and included in accordance with Title 17 U.S.C. Section 107. 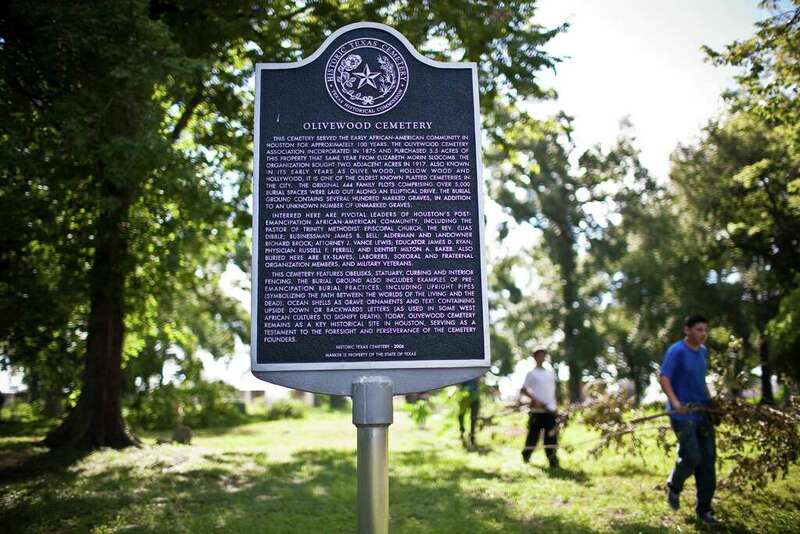 It is possible Olivewood was a burial site for formerly-enslaved blacks since two headstones date back to 1869 and 1871 respectively. Prior to the cemetery’s establishment there was a section reserved for “Negroes” in the 1840 Houston City Cemetery, on the north side of Buffalo Bayou. The original 1877 Olivewood Cemetery plat map of 5.5 acres includes more than 400 family plots around a graceful, elliptical drive that originated at an ornate entry gate. The cemetery association purchased additional property adjacent to Olivewood between 1876 and 1917. Family Plots at Olivewood Cemetery. Image available on the Internet and included in accordance with Title 17 U.S.C. Section 107. Many mature specimens of oak, pecan, and elm trees, and flowers such as tulips and lilies still bloom along with other species of flora and fauna. The headstones, monuments, landscapes, enclosures, and epitaphs in the cemetery reveal the cultural heritage and religious traditions of Houston’s African-American population. Several grave markers represent continuations and relatively unique permutations of African-American burial practices that were developed in pre-emancipation African-American communities. The continuations include two examples of upright pipes as grave features and the use of ocean shells as a grave ornament. At least six of the grave markers take the form of upside-down and inverted text. Graves are laid out in Christian-traditional west-east cardinal orientations, with the exception of several east-west alignments. There are also many examples of bordered family plots. The headstone of Frank Vance is pictured on the right, and the Baker angel is pictured on the left above the headstone of Milton A. Baker in Olivewood Cemetery. Courtesy of the Descendants of Olivewood. Image available on the Internet and included in accordance with Title 17 U.S.C. Section 107. Interred in Olivewood are several pivotal religious, social, economic, and political leaders from Houston’s post-emancipation African-American community. Among those buried here are Rev. Elias Dibble, pastor of Trinity Methodist Episcopal Church, the oldest African-American church in Houston; Richard Brock, one of the city’s first black aldermen; J. Vance Lewis, attorney; Russell F. Ferrill, physician; Charles Johnson, dentist; James D. Ryan, educator; Frank Vance and James B. Bell, businessmen; and Milton A. Baker, a stockholder of Olivewood shares. Downtown Houston is visible from Olivewood Cemetery. Courtesy of the Houston Press. Image available on the Internet and included in accordance with Title 17 U.S.C. Section 107. Olivewood Cemetery became landlocked in the 1940s by residential and commercial development (such as The Schumacher Company and Grocers Supply) which prohibited access for burials. On September 26, 1950, the association appealed to Mayor Oscar Holcombe for assistance, and the city council voted to quitclaim a lot for access into the cemetery. In 1958 the northern section of the cemetery was sold to the Harris County Flood Control District for purposes of rechanneling White Oak Bayou. “Old timers” report that an entry on the east side of Studemont was closed by Grocers Supply and in 2010s was a fenced parking lot covering that ingress. As of 2013, the only access to the cemetery was by Court Street, which divided two parts of the same business’s holdings. Neglect and overgrowth of Olivewood Cemetery. Image available on the Internet and included in accordance with Title 17 U.S.C. Section 107. The last known marked burial in the oldest section of Olivewood Cemetery occurred in the 1960s. Olivewood, like other major African-American cemeteries in the city, had many years of neglect that resulted in a loss of headstones and of history. The cemetery was abandoned in the 1970s and despite many attempts by individuals and groups to maintain and reclaim it, all were short-lived as evidenced by several newspaper articles. With no recent claim to ownership, encroachment has apparently occurred twice. Olivewood Cemetery Historical Marker. Courtesy of Eric Kayne and the Houston Chronicle. Image available on the Internet and included in accordance with Title 17 U.S.C. Section 107. In 2004 the Descendants of Olivewood, Inc. (now a non-profit organization) was formed to restore, preserve, and maintain the cemetery. The Texas Historical Commission granted the cemetery a Texas Historic Cemetery designation in 2005 and an official Texas Historical Marker in 2006 which was erected in 2008. A Harris County judge awarded the descendants organization guardianship of Olivewood Cemetery in 2008, and as of 2013 the group was continuing their mission. David E. Bruner, Symbols for the Living: Synthesis, Invention, and Resistance in 19th to 20th Century Mortuary Practices from Montgomery and Harris County, Texas (Ph.D. dissertation, State University of New York at Binghamton, 2007). Richard Connelly, “Big Step Taken In Efforts To Maintain Historic Black Cemetary,” Houston Press, November 24, 2008 (http://blogs.houstonpress.com/hairballs/2008/11/olivewood_cemetary.php), accessed May 4, 2012. Historical Marker Files, Texas Historical Commission Library, Austin. Houston Chronicle, December 28, 1994; February 28, 1999; January 23, 2000. Houston Post, October 20, 1993. 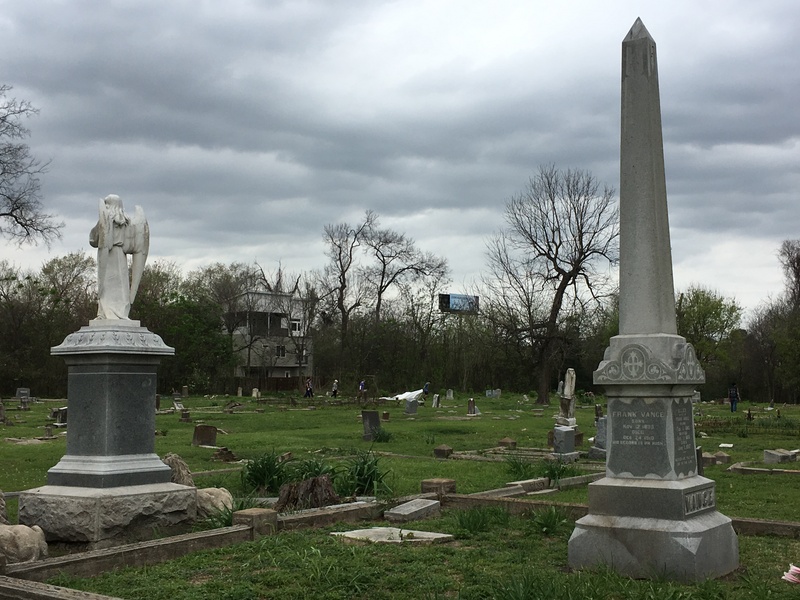 Handbook of Texas Online, Debra Blacklock-Sloan, "OLIVEWOOD CEMETERY ," accessed April 25, 2019, http://www.tshaonline.org/handbook/online/articles/leo10. Uploaded on May 15, 2013. Modified on June 28, 2017. Published by the Texas State Historical Association.